When most people think of a pool pump, they only think of the actual electric motorized pump, because it’s the loudest part. But the truth is that the pump system actually consists of several components that includes the electric motor, a diffuser (which is the one that actually pushes the water), an impeller, and a strainer basket. Find out where you can get affordable and customized pool repair. Leaks can be easy to miss for most pool owners, because they usually occur in places that are hidden from sight of the pool users, plus the fact that swimming pools and its surrounding areas are generally always wet, a simple leak will go unnoticed until it gets worse enough. Pool owners should be vigilant I inspecting the concrete that the pumps are sitting on, since this is the part where the leaks will be easiest to see. At the slightest hint of a leak, it is important to schedule swimming pool pump repair immediately. A leak that is not addressed quickly could lead to even more costly damages down the line. There is no one size fits all type of pool pump. The most common reason why many otherwise good pumps fail is that the owners chose the wrong pump for the wrong size pool. The right amount of horsepower (measured in HP) should be chosen based on the size of the pool. Choosing too weak of a pump for a large pool will result in the pump being stressed and more prone to breakdown. Ideally, if you are just buying a pool pump or need an old one replaced, you should leave it to the professionals as they will be able to gauge the right size pump for your pool. CV Pools has pool technicians who will be able to do this job for you. 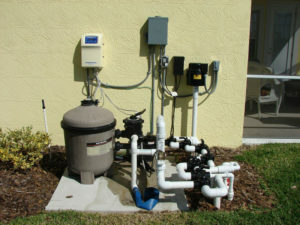 Don’t hesitate to contact us now and let us help you streamline your swimming pool pump system.